Place oil in pan to heat, while dredging beef in flour. Lightly brown the beef on all sides. 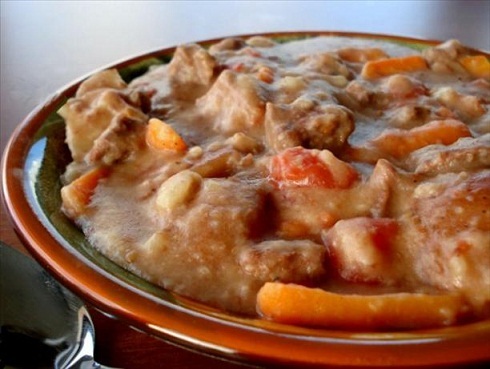 Place all ingredients in crock pot in exact order: potatoes, carrots, beef, onion, salt¸ and pepper, tomatoes or juice, and water. Never stir it until it is DONE. Cover and cook on high for 4 hours, or on low if you will be gone 8-9 hours.